The Consumer Financial Protection Bureau has exerted a light touch enforcing a 2009 credit card law that imposed significant restrictions on rate hikes and fees. 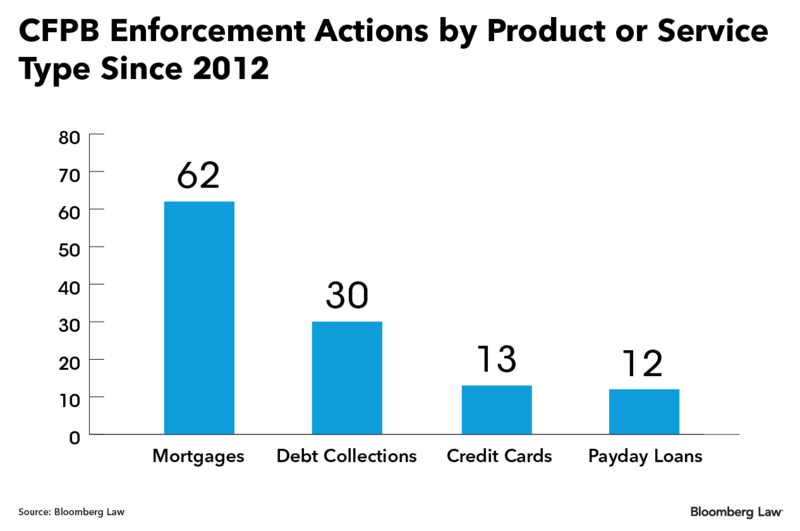 The CFPB has taken only three CARD Act enforcement actions in the past seven years. Most recently, Citigroup agreed last month to repay cardholders who lost $335 million because the big bank failed to adjust interest rates. That settlement came three years after the CFPB fined Continental Finance, a subprime credit card company, in 2015 for charging excessive fees. Two American Express subsidiaries were accused of charging illegal late fees as part of a broad 2012 crackdown on the credit card giant. The infrequency of enforcement could be explained by banks and other financial firms policing themselves, industry lawyers, consumer advocates, and former agency staffers told Bloomberg Law. Banks and credit card companies “have been able to comply with the legislation and provide just as much access to products as before,” Scott B. Astrada, director of federal advocacy for the Center for Responsible Lending, told Bloomberg Law. “Where issues have come up, they’ve likely more often been handled through the supervisory process,” Lucy Morris, a former CFPB deputy enforcement director who is now a partner at Hudson Cook, said in an email to Bloomberg Law. The CFPB takes its mandate to enforce the consumer financial laws seriously, it said in a statement. Supporters said the 2009 law, formally known as the Credit Card Accountability Responsibility and Disclosure Act, has made it easier for consumers to evaluate costs and risks by eliminating the worst pricing practices in the market. The law helped end such practices as fees for payments made well in advance by customers but recorded as late because of card companies’ processing delays or arbitrary deadlines. The CARD Act had spared consumers $16 billion in fees for making late payments and going over their credit limit, a December 2015 report by the bureau said. Banks are less enthusiastic about the CARD Act, saying it has reduced credit availability. The law’s ability-to-repay test for potential borrowers, for example, requires data collection that is “extremely time consuming,” the Consumer Bankers Association said in a letter last month to the CFPB. The CFPB has brought 13 enforcement actions involving credit cards since opening its doors during the Obama administration, according to Bloomberg Law’s CFPB Enforcement Tracker. Three of those actions targeted CARD Act violations. More prevalent were instances of the bureau using its Dodd-Frank authority to crack down on unfair, deceptive, or abusive acts or practices (UDAAP) over violations involving such activities as debt collection, credit scoring, or advertising. The CFPB aggressively used its UDAAP authority in crackdowns against credit card add-on products, a separate category in the tracker. The CFPB took a number of actions against big banks soon after its creation with a focus on add-on products such as fraud protection and credit monitoring, said longtime CFPB official Elizabeth Corbett, who is now counsel at Alston & Bird. The tracker data reveals the agency has been far busier enforcing the mortgage market, taking 62 actions in that space since 2012. There have been 30 crackdowns involving debt collection. Corbett, who spent five years at the CFPB in various roles, including acting chief of staff, before leaving the agency in March 2017, said banks “have done a pretty good job” implementing the CARD Act.